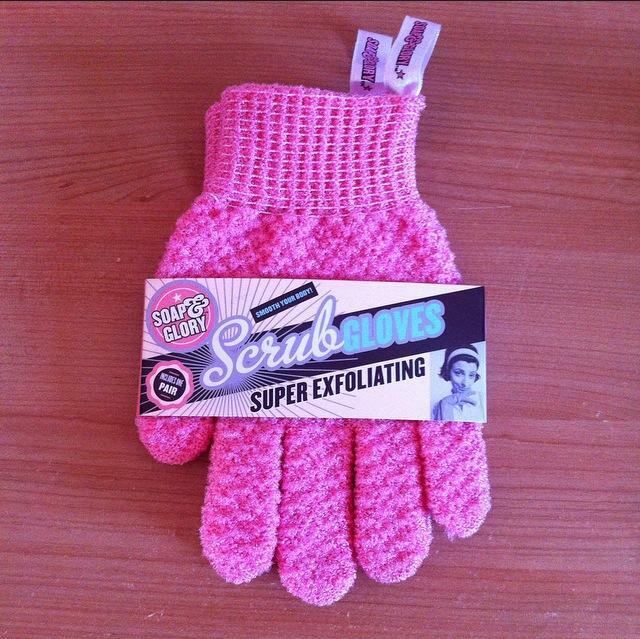 So today’s review I’m going to talk about one of my favourite new items I’ve bought in ages – Soap & Glory‘s Exfoliating Scrub Gloves. As you can tell by that introduction, I really liked this product. You see, I’m really particular with body exfoliator. I find that most of them aren’t gritty enough and don’t feel like they’re actually even doing anything, so it annoys me as I can pay out a lot for a product and feel like I haven’t got much in return. However, I definitely don’t feel that what about these gloves. You’ve probably got the gist, but to explain them properly, they are exfoliating mitts that you just put on like normal gloves and use in the shower. You don’t have to use any extra exfoliating product with them – just squeeze some of your normal body wash onto the product, lather up and you’re away. As you can see, the product is really easy to use and it totally works too. The gloves give you a nice, deep scrub that feels like it’s actually doing it’s job, without feeling harsh on the skin. They are also really cost-effective, as they are only £4 and will last much, much longer than a bottle of exfoliator. Being pink, they also look totally pretty hanging in the shower. So my advice is definitely to give these a go! I would say to use them 2-3 times a week in the shower for silky smooth legs, making sure you apply moisturiser after. 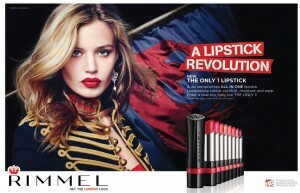 You can buy them from Boots here. Happy scrubbing and let me know what you think of the gloves if you try them out! Just a quick post to show you my new haircut! 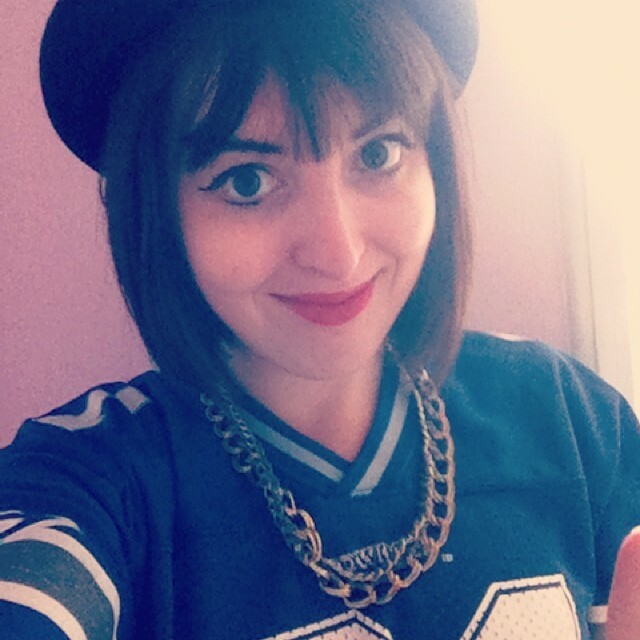 Now, I know it’s not really that summery to have a fringe & a bob, but I was just so bored with my hair. I had it short and was growing it out, but I couldn’t stand it being to in-between anymore and I didn’t want extensions, so there was just one thing for it – cut it off! It’s probably a little shorter than I wanted it at the moment, however, hopefully it’ll grow quite quick in the sun so I can make it a bit more versatile. What I do love about a fringe though is that it makes me feel so much more stylish and makes me dress more fashionable I think, as I am trying to match in outfits with my fringe. Anyway, I just thought I’d show you all. I’m sure you’ll be seeing more of my new ‘do in my upcoming posts! I can’t believe it’s July already and I haven’t even had chance to write about this event yet! Time flies huh?! 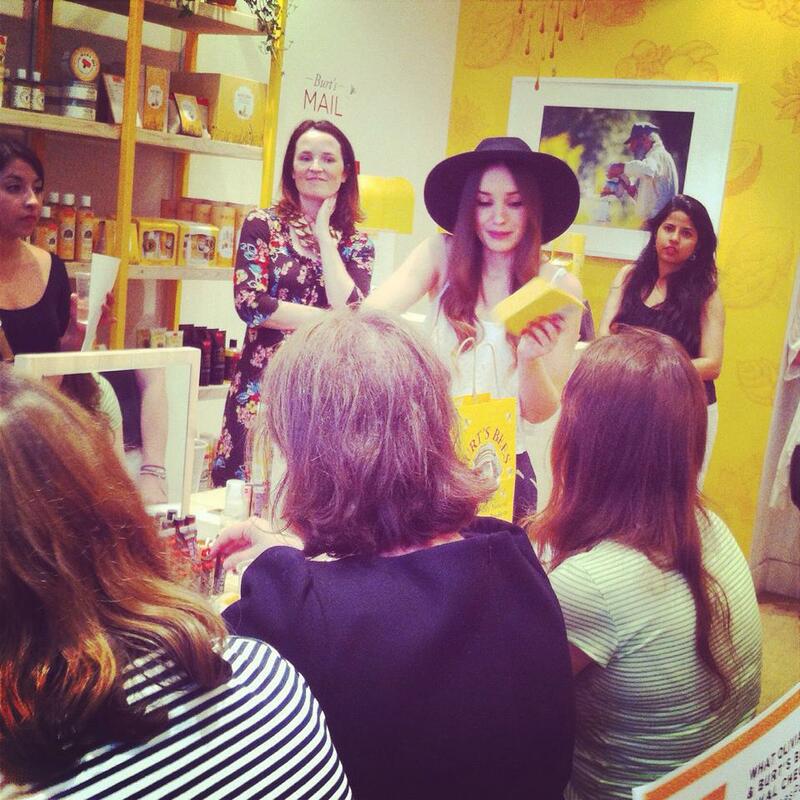 So basically, last month, I headed up to London to go to the fantastic Burts Bees event with Olivia Purvis from well-known blog ‘What Olivia Did’. 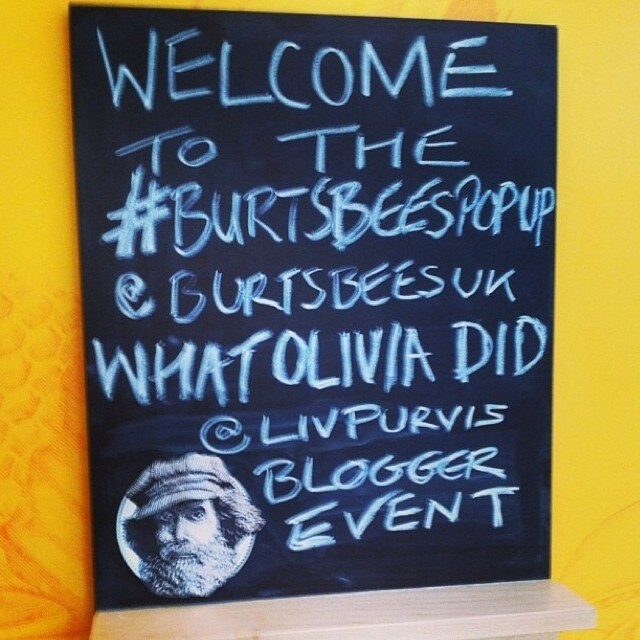 The purpose of the event was for Olivia to go through her best tips to stay fabulous throughout the festival season as well as show for the lovely Burts Bees peeps to show off some of their newest and most-loved products. 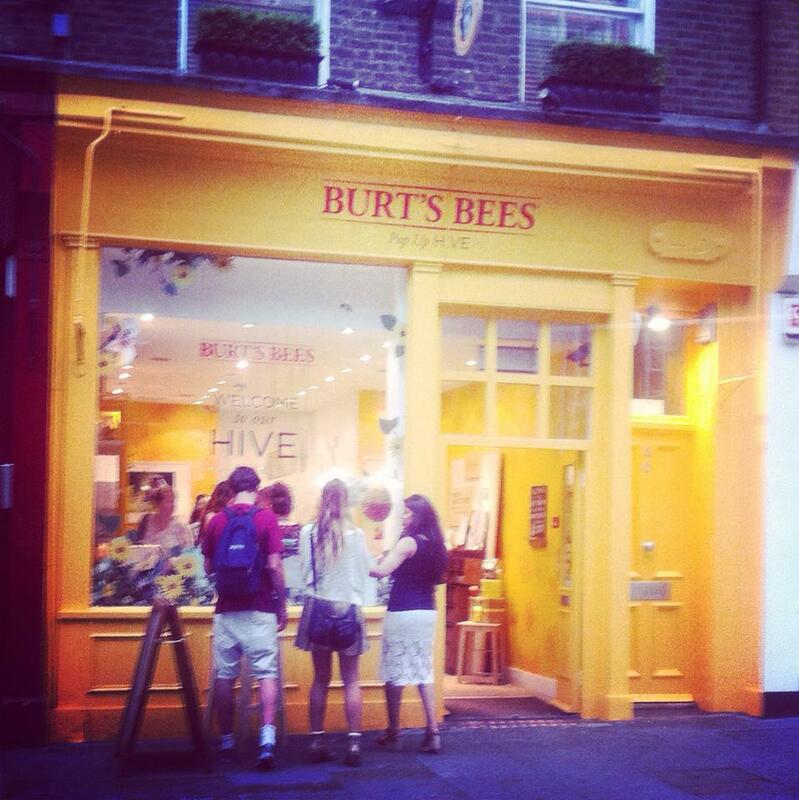 The event was held at the Burts Bees Pop-Up shop in London’s Monmouth Road. The shop has sadly gone now (it was only there until June), however look out for any similar shops in the future! I got to the event a little flustered as my train was delayed, however I relaxed as soon as I walked in thanks to the lovely Burts Bees staff who greeted me and also because of the lovely prosecco they also handed to me! There were lots of other bloggers there already trying out some of the products and I had a quick look around to see what some of the products were like. After that it was time for Olivia to come out and have a chat with us all. She had some great tips for the festival season up her sleeve. These included taking a cheap phone, using disposable cameras and having some sensible mud-proof boots. 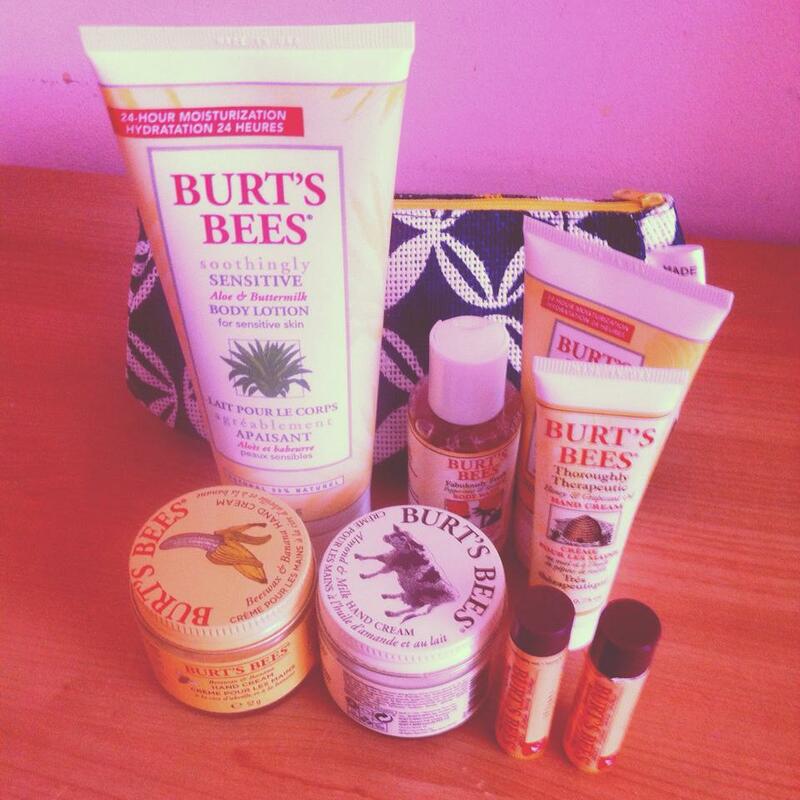 She also recommended some of the Burts Bees products which were perfect to take to any festival. These included Burts Bees Lip Shimmer, which she said was nourishing yet pretty and the Burts Bees Aloe & Linden Flower After Sun Soother if you stay out in the sun a bit too long! The Burts Bees Facial Cleansing Towelettes with White Tea Extra were also a must, according to Olivia, to get off the days festival make-up. After Olivia’s talk (and more prosecco) we were then allowed to try out more products and buy any that took our fancy. I went for the Aloe & Buttermilk Body Lotion, as well as the Almond & Milk Hand Lotion, as well as the banana version of the latter too. When buying these I was then handed a goody bag full of even more treats such as a make-up bag, two Acai Berry Lip Balms, a miniature Peppermint & Rosemary Bodywash and a miniature Honey & Grapeseed Hand Cream. It was definitely fair to say I was pleased and loaded down with goodies! The good thing about all these products is that the ingredients are packaging are all natural as well as working great. 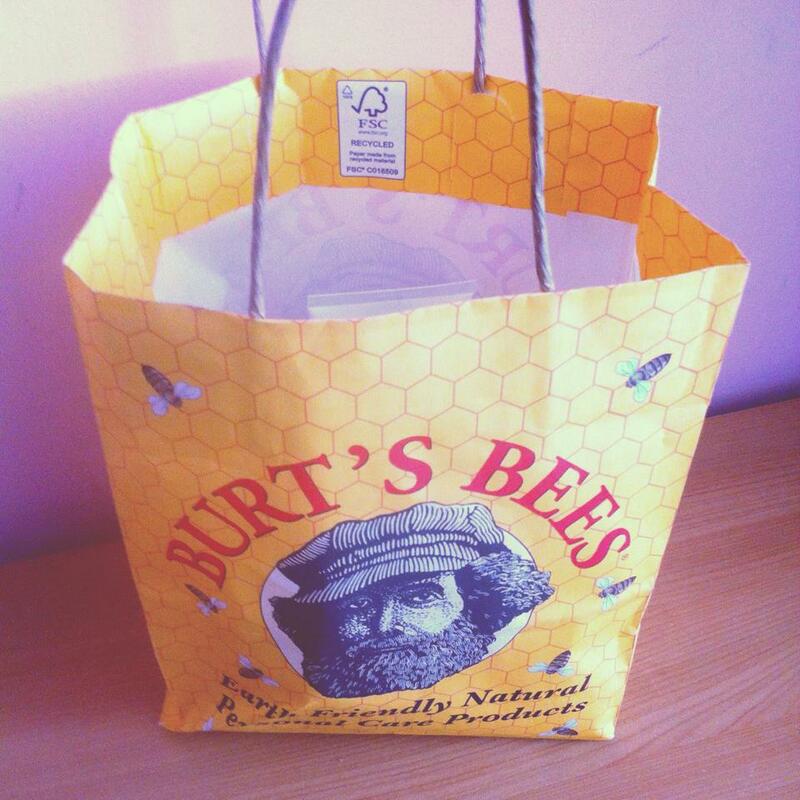 Good work Burts Bees! Before I went, I also got to have a quick chat with Olivia, who, to my surprise, told me that this was her first kind of event that she had done. I was really shocked considering that Olivia has been blogging for a good few years now. I told her that she should definitely do some more though and that I will definitely be attending them! Left: The beautiful Burts Bees Pop-Up shop. Right: Some of the testers available on the night. 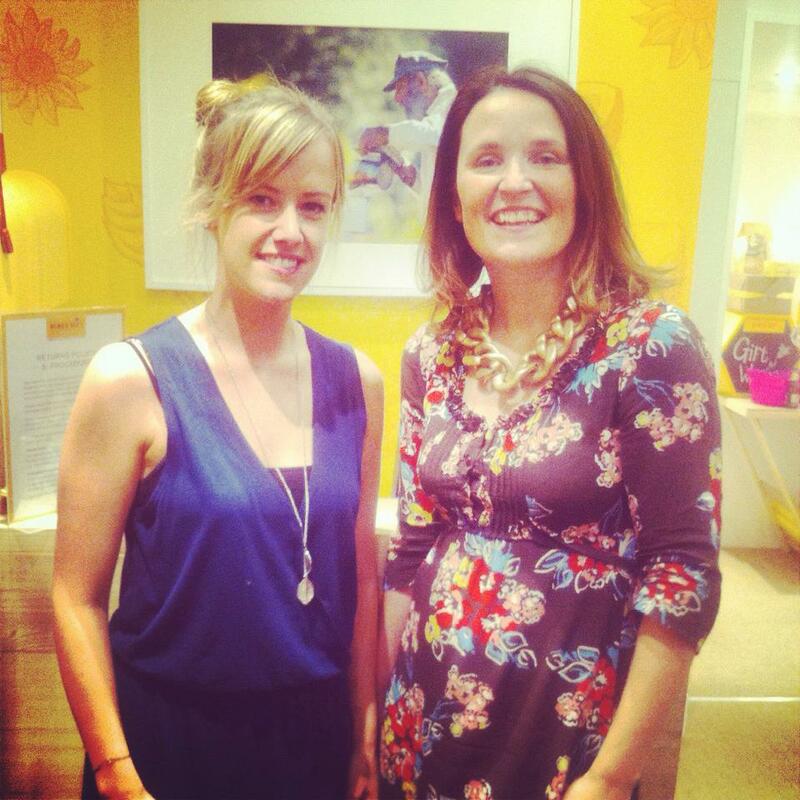 Left: Two of the lovely Burts Bees ladies. Right: Olivia shows us how to get festival fab. Above: Some of the lovely goodies I came away with! I have always had quite thick hair & I’m used to it being quite big, which I like. However, just recently my hair felt really bogged down for some reason & definitely wasn’t as bouncy and full as it usually felt. I had been using a colour protect shampoo as I had dyed my hair a red shade and I know that it fades easily. I don’t know whether this was the reason it felt heavy and flat if it was locking in the colour, but I definitely knew I needed to try something. Feeling a bit down about it (you know what us girls are like) I asked my friend and fellow beauty blogger Lauren what she thought I should do. She suggested a clarifying shampoo. So, off to the shop I went in search of one. I looked in Boots & Superdrug, but I literally couldn’t find any and thought I might have to go online. However, as a last resort I tried a Tesco Extra and found Herbal Essences ‘Fresh Balance’ on the shelf. Personally, I love Herbal Essences as a brand. They offer a wide range to suit all hair types, smell lush & are not too expensive! I decided to go the full wack and buy both the shampoo and conditioner. These were £3.79 each, which are a tad more expensive than the other types in the range, but it’s still not expensive and I definitely needed to try something. On first use, I noticed the gorgeous smell. With citrus blossom extracts it really creates a gorgeous fruity aroma in the shower. The shampoo also lathers up lovely, more than any other shampoo I’ve used. I washed my hair with it twice and noticed that it left a squeak after I did, which made me feel like my hair was really clean. I followed up with the conditioner after, which had an equally great smell and left my hair feeling soft. When I got out of the shower I was eager to dry my hair to see what it was like and I definitely wasn’t disappointed… Before when I went to comb my hair the brush kept getting stuck in the knots, however it was now coming through easily and I had my big bouncy hair back. I was so pleased that I had to take an Instagram of the effect straight away! I know it’s sad, but you definitely feel better when your hair is better and this product helped me do that so I would definitely recommend it if you feel like your hair is a bit flat and bogged down. The only thing I would say is that it might not be suitable for everyday washing as it may leave your hair a bit dry. If you do wash your hair everyday though, you could just alternate this shampoo with another. 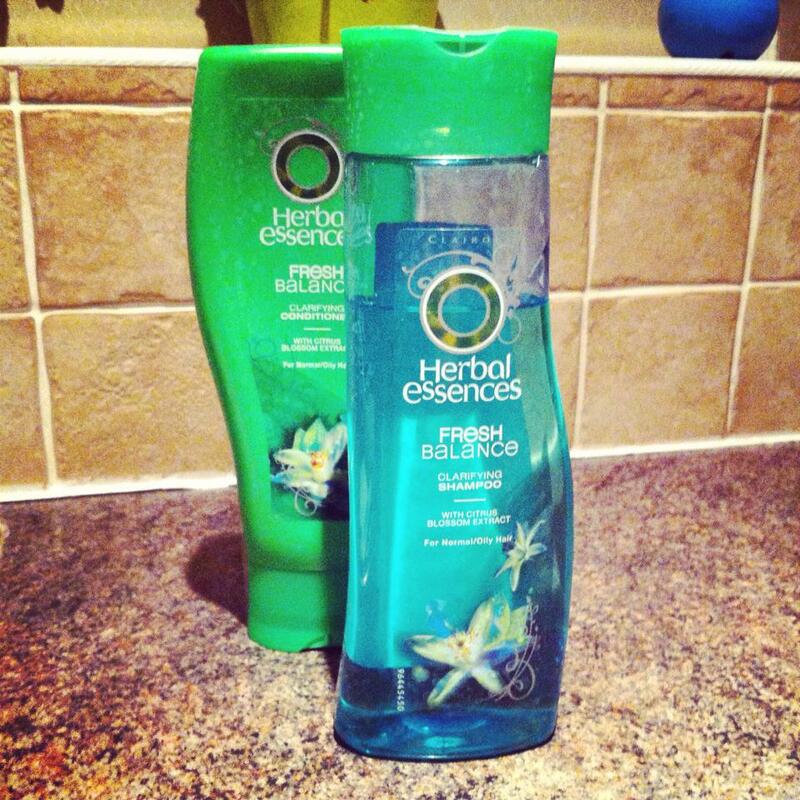 But yes overall it’s a massive thumbs up from me – Herbal Essences you’ve done it again! Let me know if you’ve used this product of if you have any wonder shampoos that you use. P.s. This shampoo and condition are buy one get one free in Tesco at the moment so snap it up while you can!